Silverhill Tools ANS20P516 5/16'' Magnetic Nut Setter Power Drill Bit (20 Piece) (Pack of 20) by Silverhill Tools at N Online Agency. MPN: ANS20P516. Hurry! Limited time offer. Offer valid only while supplies last. Perfect for Contractors, Business Buyers, Repair Centers and Assemblers, this bulk pack of Power BitNut Drivers comes in a handy wholesale bulk lot. Perfect for Contractors, Business Buyers, Repair Centers and Assemblers, this bulk pack of Power BitNut Drivers comes in a handy wholesale bulk lot. 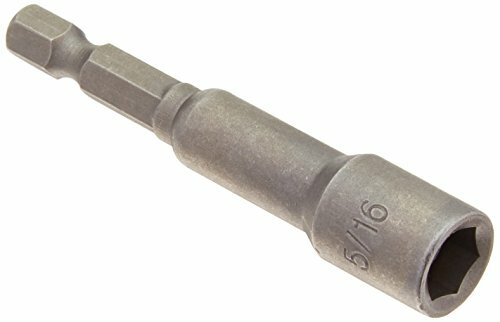 Approximately 3 inches overall length, fits in any power screwdriver or standard 1/4 inch bit driver. Bulk lot for contractors, builders, techs, assembly houses, etc. If you have any questions about this product by Silverhill Tools, contact us by completing and submitting the form below. If you are looking for a specif part number, please include it with your message.